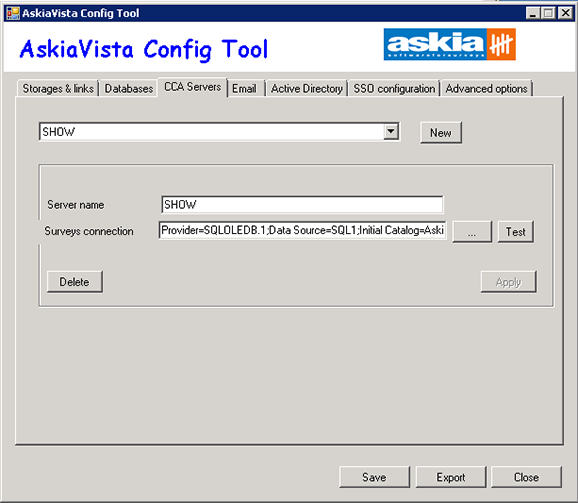 Summary This article describes how to add a CCA server to your askiavista environment. This component, also known as AVC, is a .NET 2.0 application. It uses the AskiaVistaCmn to create, read & update askiavista's askia.config file. The paths to all surveys are recorded into the askiavista database. If the locations of the surveys are ever changed the recorded filepath will need to be updated as well. Note: You'll need the former file path to the surveys and the new filepath. Enter the path of the root directory where all surveys are stored, by default this is C:\Askia\AskiaQes\ , into the Text searching in actual location textbox and enter the path of the root directory to the location of where the surveys have been moved to in Text replacement textbox. Then click replace. Note: The find and replace function is case-sensitive and will make the best effort to update filepaths. Once this is completed open sql management studio and navigate to the AV_Survey_Categories Table. 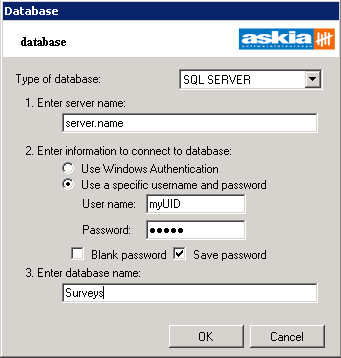 There are instances where the Sql connection builder will be unable to assist you in creating the connection string settings for the askia.config file. This is where you are connecting to special types of clusters and load balanced sql servers. Note: If you are using a single Sql server instance or network loadbalancer than the Sql connection builder should still be used.